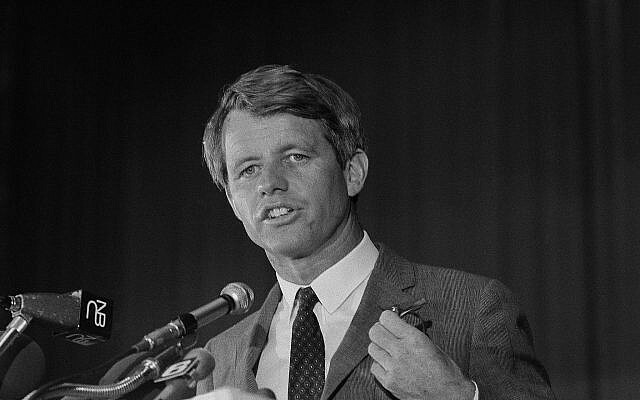 On June 8, 1968, after a funeral mass was held at St Patrick’s Cathedral in New York City, a train took the casket of Robert Kennedy to Washington DC where he would be laid to rest not far from the grave of his brother, President John F. Kennedy, in Arlington National Cemetery. Kennedy’s train was reminiscent of the funeral train that bore Abraham Lincoln’s remains from Washington to Springfield, Illinois 103 years before. And like the Lincoln train, it moved through both city and countryside with thousands of Americans lined up to pay their respects and give a final tribute to the presidential candidate. Along the way were prominent citizens, elected officials, veterans, police, youngsters in baseball and Boy Scout uniforms, rich, poor, Black, White, Hispanic, young and old. Many stood quietly as the train passed, others wept openly and many stood at attention and saluted. Many brought signs “Goodbye Bobby” or “Farewell Bobby.” Many brought US flags which were on staffs or held up by two people. Thousands brought cameras to record the event. They had gathered hours beforehand waiting for the train to pass. The train which departed at 1 pm from New York was to pass through Elizabeth, over the Delaware River at Trenton, Philadelphia, Sharon Hill, Wilmington, North East, over the Susquehanna River, through Baltimore with the final destination at Union Station in Washington DC. Because of an accident that killed bystanders waiting for the train, the entire North East travel corridor was closed so the funeral train could make its way slowly south. It arrived at 9:30 pm necessitating an evening burial at Arlington National Cemetery. 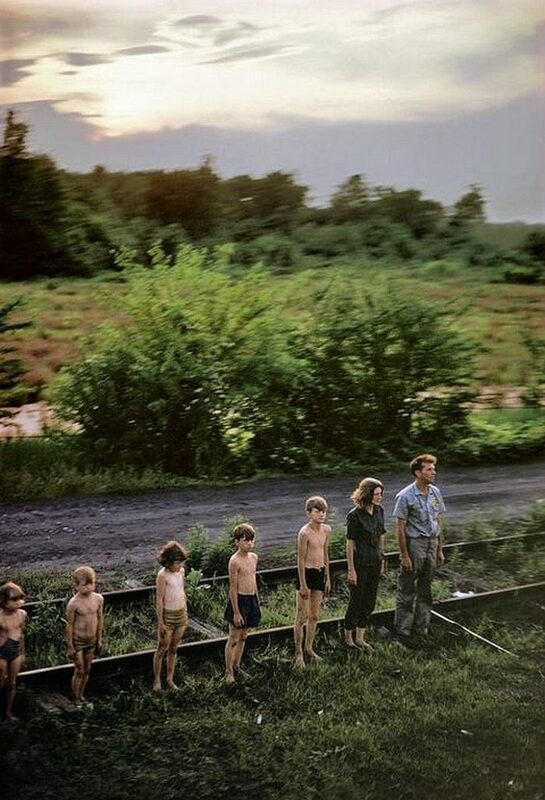 This photo shows a family of seven lined up with the children in order of birth. The children are wearing swimming trunks and are dirty, perhaps from playing before the train arrived. The parents appear to be in their 30s and both appear to be of a blue collar worker family. The father is wearing a soiled uniform of perhaps a gas station attendant, a maintenance worker or construction job. The mother is dressed in shirt and pants, perhaps a stay at home mom. The image is one of a lower middle class family. Everyone is standing at attention and in a silent, somber pose. 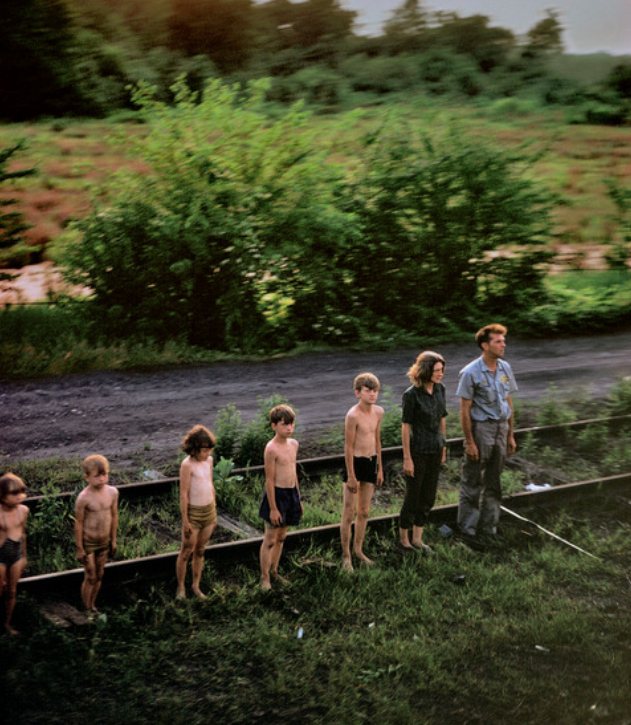 The father may have been a veteran and may have instructed the children to stand this way as the train passed. The photograph is a poignant and powerful image of the outpouring of grief and sadness at the assassination of yet another public figure. This entry was posted on Thursday, June 7th, 2018 at 7:13 am	and is filed under General Interest. You can follow any responses to this entry through the RSS 2.0 feed. You can leave a response, or trackback from your own site.